I put, in this order, the onion, garlic, Brussels Sprouts, mushrooms, corn, bok choy, and seitan into a large Saladmaster stock pan. I cooked waterlessly - i.e., I covered the pan and heated it on medium high until the vapor release started jiggling, then I reduced the heat to low till the jiggle stopped. I let it cook for about 20 minutes. I then mixed in the remaining ingredients and served. 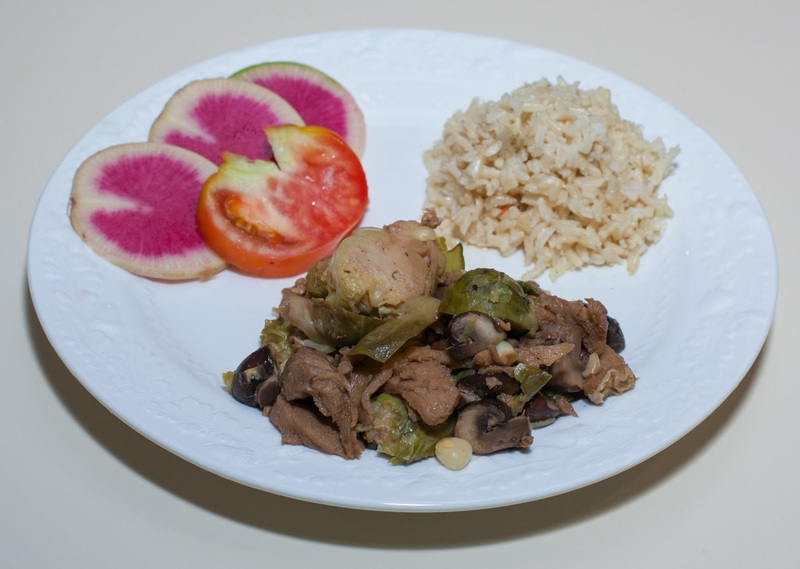 I also served brown rice (which our friend loved), watermelon radish, and heirloom tomato. My daughter made kale chips, which I served separately just before serving the rest of the meal. I recently gave my daughter an excellent book by Ruby Roth, The Help Yourself Cookbook for Kids: 60 Easy Plant-Based Recipes Kids Can Make to Stay Healthy and Save the Earth. 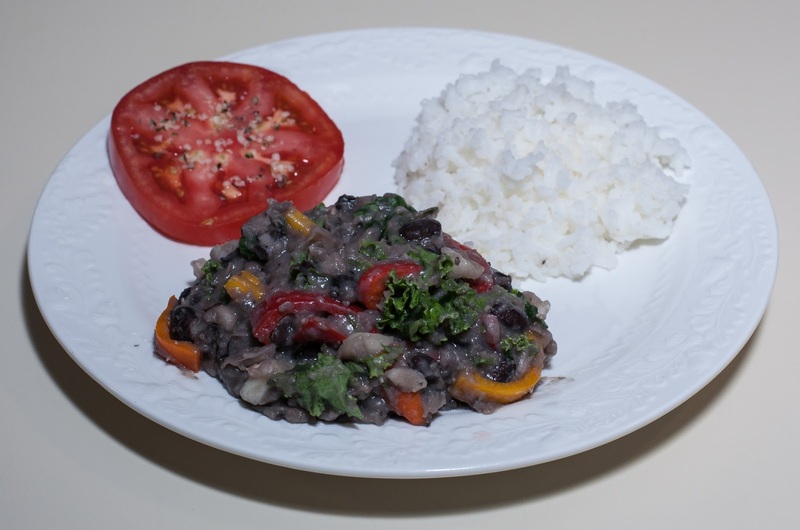 It's colorful with easy and healthful recipes. She loved making kale chips a few weeks ago and did that again. It's really easy - kale is roughly hand torn into 1 1/2" or so squares, patted dry, then hand mixed with some nutritional yeast and salt in a preheated 400 degF oven for 20m (I found that 15-17 minutes was enough tonight). Dinner was great - our guest seemed to enjoy it all. I was quite pleased with the main course; it came out even better than I had hoped. I am always happy when I cook waterlessly. I should do it more regularly! A few days ago, I took my daughter to Remedy Diner in Raleigh, NC; they had an interesting special Brussels Sprouts sandwich. I want to try a sandwich with Brussels Sprouts sometime soon. I couldn't believe that Weaver Street Market, a local coop, had so many great prices and items on sale a few days ago. They had, for example, jumbo artichokes for 99 cents apiece! I wonder how they could make money at this price! Even more exciting, they had this hybrid melon called a melonade. Folks at the coop said that it tastes like lemonade and offered my daughter and me samples - wow, they're right! I could only find two references to melonades online; one describes this as "sweet with bright notes of citrus, the Melonade Melon is a new variety melon. This crisp, juicy melon is one of the most refreshing we’ve ever tasted" and the other, apparently from May 2015, characterizes the melon as being of "Round shape, Tart-sweet, Tones of citrus". Surprisingly, its PLU code of 4325 searches in the International Federation of Produce Standards website as a "French Breakfast" melon. Anyway, we're loving this melon and quickly finished 1 1/2 of them. I made "ice cream" out of the melon tonight for dessert! More on that soon, but first let me describe dinner. It's been a while since I've served steamed artichoke hearts; I can find notes from 2012 and then, before that, 2009. I used to make a simple sauce out of melted Earth Balance margarine, either rosemary or oregano, salt, small bits of onion, and maybe garlic powder, plus lemon or lime juice. I did just that for my daughter so that her first experience with eating a freshly cooked whole artichoke would be more traditional, albeit with a bit of fat. I had a bottle of no fat fig balsamic vinaigrette on hand. We rarely use salad dressings, but I wanted to try this for its flavor in a dish. Today was a good opportunity! The cooking process was trivially simple - in the case of eating fresh artichokes, the eating process is what is complex! 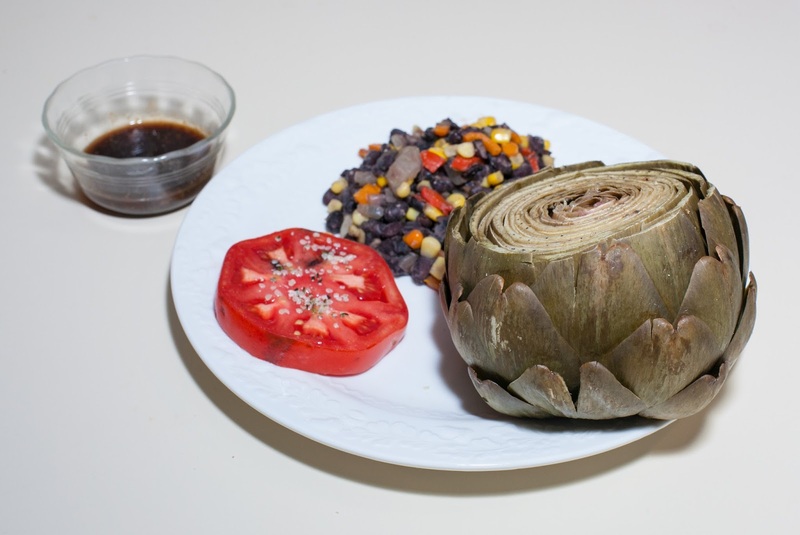 I started by rinsing the artichokes, being careful to direct water into the artichoke. I removed the stems, a handful of discolored and smaller outer leaves, and about 1/3 of the tops. I put 3/4 or 1 cup of water in my Instant Pot pressure cooker, put in my steamer trivet, and made sure that the water level was below that of the trivet. I put the artichokes atop the trivet and pressure cooked for 25m. I had considered pressure steaming, but food shouldn't touch the pot when pressure steaming; I was fortunate that all three artichokes fit, and was originally thinking that I'd need to use two of my three Instant Pots. While the artichokes were cooking, I mixed the dipping sauce. After the cooking was done, I waited a few minutes and gently released pressure, then served. I also had made some black beans (soaked for about 5 hours initially with boiling water and then cooked with enough water to cover plus about 1/4" for 25m). After the beans were done, I transferred them to a pot and mixed in a little corn, bell pepper, onion, garlic, garlic powder, ground cumin, and salt, then heated gently till ready to serve. For those who haven't eaten artichoke prepared from scratch, the initial goal is to dip the heart (deep) end of each leaf into the dip and enjoy, scraping off the little bit of white flesh in the mouth, then tossing the leaf onto a pile destined to be composted. Outer leaves often have little flesh and can just be composted. When one gets near the heart, the sharp immature leaves need to be removed and, with the help of a spoon, the "hair" beneath also removed. What's left is the yummy heart, which is dipped and enjoyed. My wife actually took her time and found more than the deep ends of the leaves to be enjoyably edible. We all loved dinner! I was surprised by what my daughter said at bedtime. I always ask her to recap her day and describe her favorite activity - she had a lot of fun today but claimed that dinner was the hilight!! Oh - the ice cream was divine! We all loved it, served with an organic strawberry atop. My daughter said that this is the best ice cream that I've ever made! It's a fun and tasty process eating artichokes cooked from scratch. I should explore other no fat dips, such as perhaps miso-based. I might want to try a low fat dip, such as a nut-based "cheese" sauce. I wanted to make a bean main course and was about to put on some whole grain rice when my wife asked me to use white rice. 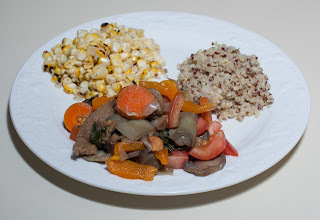 I'm not a fan of white rice as whole grain rice not only is far healthier, but also tastes a lot better. However, my wife had bought some white rice and prepared it I think for somebody who wasn't used to whole grain rice, and had some leftover. I mixed the beans, rinsed them, and let them soak. I didn't start this till maybe 5 hours before cooking, so started off with boiling water; if I had soaked overnight, room temperature water would have been fine. I rinsed the beans again and put them in the Instant Pot pressure cooker, along with enough water to just cover the beans plus 1/4" more of height. I added the ginger and vegan bouillon cube, then cooked for 25m. After the cooking was done, I waited a few minutes and gently released pressure, then mixed in the rest of the ingredients. We all enjoyed the meal, though I missed brown or other better rice. The salt and lime really made the beans shine! I should try more dishes that combine two different kinds of beans. Today, the beans were softer than they needed to be; I could make a similar dish next time in maybe 22 minutes. I put, in this order, the onion, garlic, chickpea, cabbage, and corn into a large Saladmaster stock pan. I cooked semi-waterlessly. Because everything was cooked except the frozen corn and cabbage, I didn't have to do true waterless cooking, but I first gently stirred all the ingredients and heated it on medium high, stirring, for a minute or so, then I reduced the heat to low, covered, and cooked for about 5 minutes. When I was ready to serve, I mixed in the lime juice and salt first. I also served a thin slice of whole rye bread with a light smear of hummus (surprisingly, it's only about 1 1/2 g of fat per T, and I used about 1/2 T, so I will still call the meal no added fat), tomato, and pickle. Madagascar Pink rice completed the meal. Corn went well with the main course, which all of us liked. I thought that the main course could have used a bit more crunch and maybe a tad more flavor; maybe some raw onion mixed in at the end would have been nice. I only bought a half head of Napa cabbage; I should use it more frequently. We've been growing oyster mushrooms at home. It's fun when they suddenly start sprouting - they sprout quickly and grow quite large over 2-3 days. I've loved recently using Chorizo Seitan by Uptons Naturals. It is not spicy hot enough to bother my daughter, though she doesn't enjoy this seitan as much as my wife and I do. I made a simple saute of the mushrooms with the seitan. Yum! A particularly nice cousin of my wife's is visiting for a few days and arrived this morning. I was even more excited than usual about cooking! 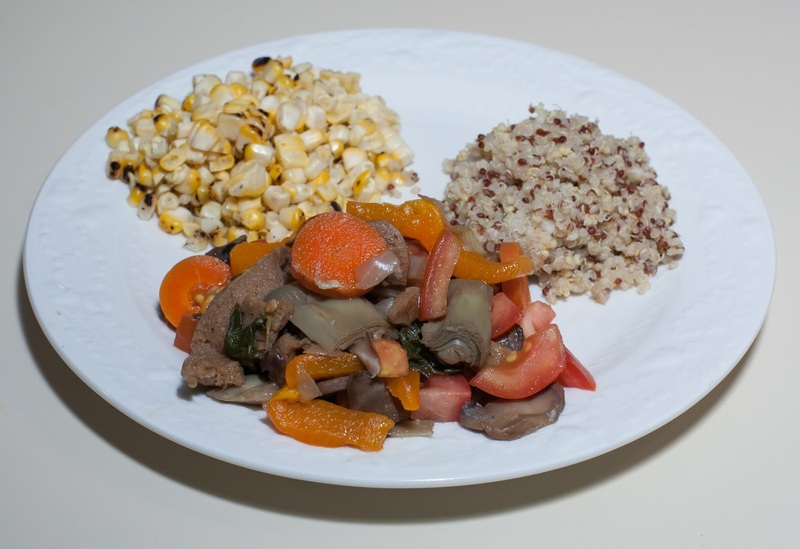 I thought that I'd make a waterless seitan and vegetable dish. I made some corn off the cob and quinoa; I normally have a salad, so wondered what the main course might be like with fresh tomato. Here is what I did. I put, in this order, the onion, garlic, artichoke, mushroom, kale, seitan, and carrot into a large Saladmaster stock pan. I cooked waterlessly - i.e., I covered the pan and heated it on medium high until the vapor release started jiggling, then I reduced the heat to low till the jiggle stopped. I let it cook for about 20 minutes. While the dish was cooking, I roasted a bell pepper by putting it directly on flame (from my gas range) and turning it occasionally till it was mostly charred. I then put the pepper into a brown paper bag and crumpled the bag closed. After about 15 minutes (the longer the better, up to about 45 minutes), I removed the bell pepper from the bag, ran it under cold running water, rubbing the burnt skin off, then cut it in half and removed the membranes and seeds. I then cut the pepper into approximately 1" x 3/8" strips, coming up with about a cupful. When the waterless cooking was done, I mixed in the bell pepper, tomato, salt, and pepper. 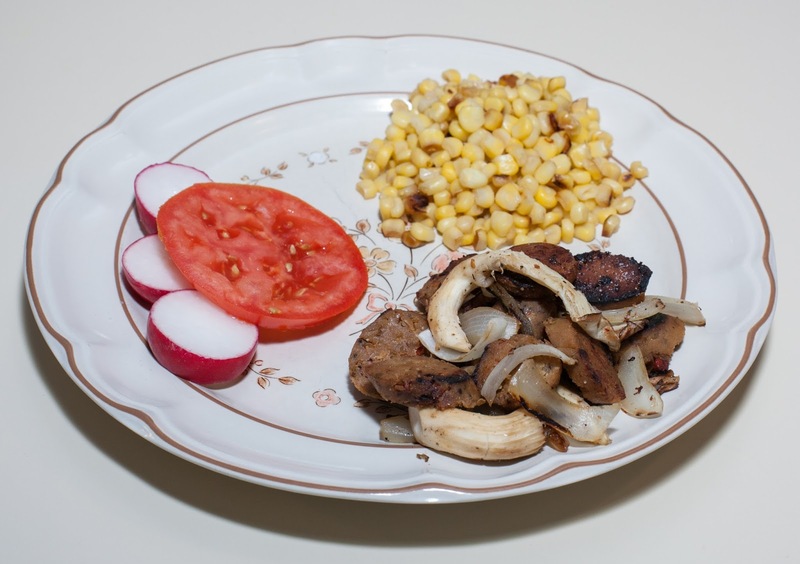 I also served some corn off the cob with lime juice and salt, as well as quinoa with onion and garlic. I loved dinner and, more importantly, my wife, daughter (except for the quinoa, which she doesn't like), and cousin seemed to really enjoy it. The main course was excellent primarily because, I think, of the combination of seitan and artichoke. The tomato was a very nice addition but the dish didn't rely on it. I should experiment with more cooked dishes with raw tomato or maybe Napa cabbage or other ingredient added at the end. I put all of the ingredients except the salt, lemon juice, and onion into my Instant Pot pressure cooker and cooked for 25m. After the cooking was done, I waited a few minutes and gently released pressure, then mixed in the remaining ingredients and served.